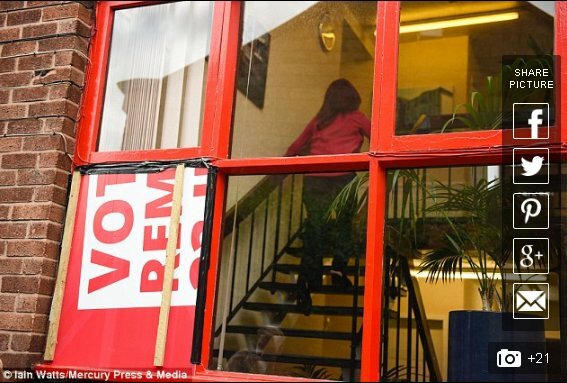 Through this window, you’re looking at Angela Eagle’s office in Sherwood House, Wallasey. That’s according to Ms Eagle, last year, anyway. NOTE: As Facebook is actively hostile to social media sites like Vox Political, you are strongly urged to subscribe to this site using the box on the left of the screen. It is currently the ONLY way to ensure you don’t miss an article. That’s right – it is one year since then-Labour leadership candidate Angela Eagle claimed that left-wing supporters of Jeremy Corbyn threw a brick through her office window, in an attempt to smear Mr Corbyn’s support base and put Labour members off voting for him. One year on, what do we know? It is impossible to know who broke the window. No evidence exists to support Ms Eagle’s claim, so she was wrong to make the false accusation. It is impossible to know how the window was broken. No brick was ever recovered from inside the office building. The window that was broken did not open onto Ms Eagle’s office – unless the only feature of that office was a staircase used by other occupants of the building. Ms Eagle stood down as a leadership candidate, to make way for Owen Smith. When the election was held last September, Mr Corbyn was returned as leader with an increased majority. So the Left – and supporters of Mr Corbyn in particular – were vindicated and we were left to wonder whether Ms Eagle made up her story. And now right-wingers – including Conservatives – are claiming the Left is responsible for a wave of abuse against politicians. Can anyone doubt that these accusations will be discredited in a similar way? To finally put the case to bed they said the person who reported the crime only described damage to a shared stairwell window, reasoning that if the constituency office window (on another side of the building) had been damaged, it would have been seen and reported by the same person. All this was known on the day, 12th July, a year ago, but couldn’t be released in order not to damage the investigation. We had to wait until February this year, when the media had moved on and the damage was done. After intensive inquiries the police finally had to close the case without making any arrests. Luckily, here on Wirral we have Police and Crime Commissioner and long term friend of Angela Eagle – Jane Kennedy – who had the case wrapped up within minutes, telling TV crews and the waiting world that it was Corbyn supporters. I complained to IPSO, chaired and led by Paul Dacre (the Daily Mail) and Tom Newton Dunn (The S*n). They said my case was without merit and the newspaper reporting had been “factual”. There are doubtless agent provocateurs at work.